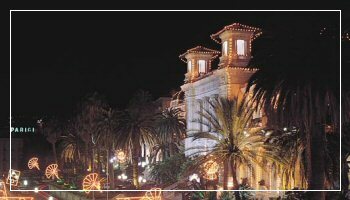 The charm of the game, the tinkling of the roulette ball, the rustle of the chips on the green cloth… the Casino of San Remo has always been one of the main attractions of the town. Conceived in the late 19th century and financed by the local banker Bartolomeo Acquasciati, who in 1898 paid as much as 1.2 million lira to the town council for its construction, the casino was designed in its current Art-Nouveau style by the French architect Eugenio Ferret and came to life on January 12th, 1905. Since then, there have been many scandals and legends, as rulers, celebrities, pop stars, artists and scientists have passed through its huge halls. Indeed, there are plenty of anecdotes related to the history of the casino. For instance, it is said that Egyptian King Faruk once claimed he to win a poker game by exhibiting only three kings, stating “I am the fourth.” The famous Italian cinema director and actor Vittorio De Sica used to tell his friends: “When I go to Heaven, please put on the casino façade one of those medallions that usually adorn the ancient theatres, inscribed ‘De Sica fecit’, because I have surely paid millions to the Casino of San Remo with all of the losses I have experienced over 30 years.” The passion for the casino is often without boundaries or limits. As the German Erika and Klaus Mann wrote on their cutting baedeker Riviera in 1930, “Gambling reigns supreme in San Remo. There are people who seem as if they want to be ruined by gambling, and they prefer to stake their finances in San Remo rather than in Montecarlo or Cannes, because if you lose in San Remo, you lose it elegantly, in a respectable way”. Nowadays, the casino boasts not only the most popular European and American games, but also several theatrical, musical, and cultural events.